Finally, a road review! Took a while but I have finally gotten around to visiting a field other than Stony Brook and writing about it! I’ve been to everyone already, now I’m just writing about them. Out of all the parks in the Cape that aren’t Stony Brook, I’ve been to Eldridge the most. It makes sense, Orleans is close to my house and I’ve been to plenty of games here. Let’s put my positive history aside and analyze the park critically. Would you like this place? Let’s find out. 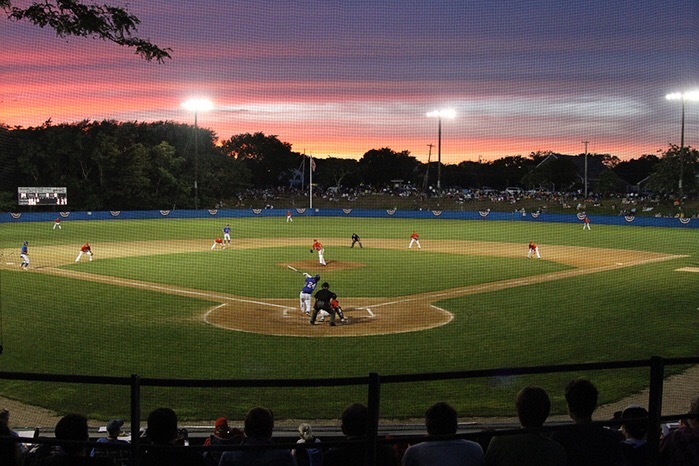 This is Eldridge Park, home of the Orleans Firebirds. 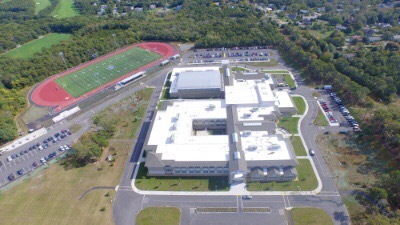 Eldridge is located at Nauset Regional Middle School, right on the corner of RT. 28 and Eldridge Parkway. Those are two busy streets in the town and the field is hard to miss. 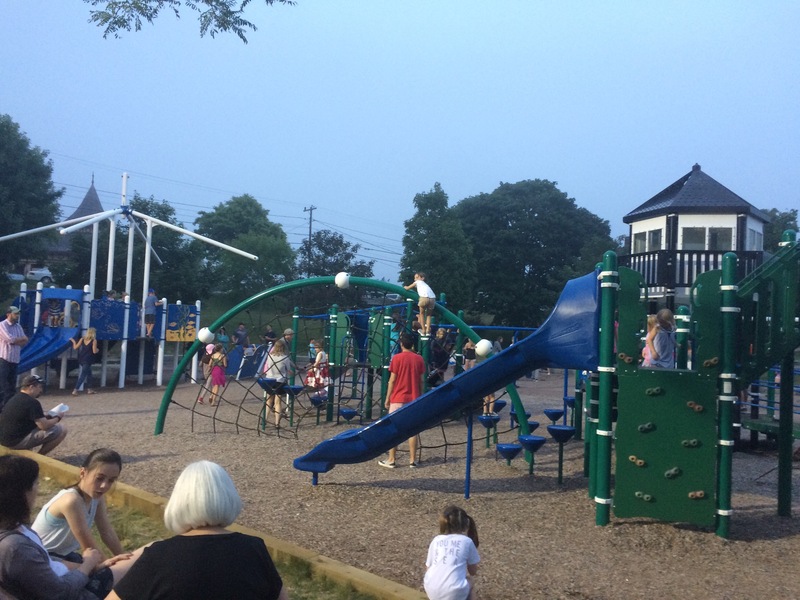 It’s easy to see from the street and frequently attracts attention. On top of being visible, the park also has plenty of parking. The school has a sizeable parking lot for the early crowd and a separate football field and track where they can direct overflow traffic to. It can be a bit hard to navigate lot traffic but that can be said if every large lot ever. Point is, there’s plenty of it for people who drive by, like what they see, and want to stop and watch for a bit. 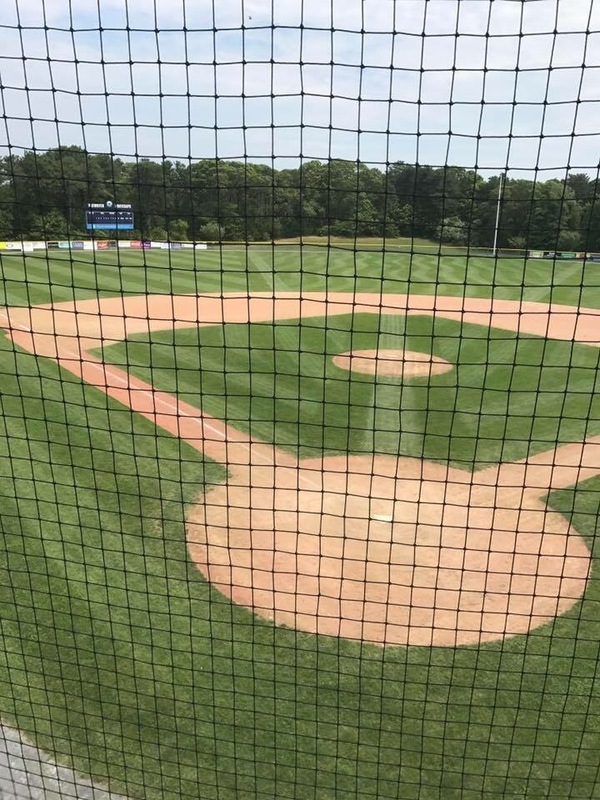 In addition, Eldredge is quite well located within the town. Orleans is a fairly small place. But it swells significantly in the summertime. It has a great business district for shopping, restaurants, and general merriment. There’s also a theatre, a few great beaches, and plenty of good entertainment for the whole family in town. A number of these things are a short drive from the field, but that’s not too much of a concern. It’s close enough to make everything doable in a weekend or so. The business district is also close enough that you could have a short walk to the field. It’s not the ideal setup, but you can do it. All things considered, I have absolutely no problems at all with the location of the field. It works as a part of the Orleans experience and can cap a great day exploring the town. Perfect marks here. 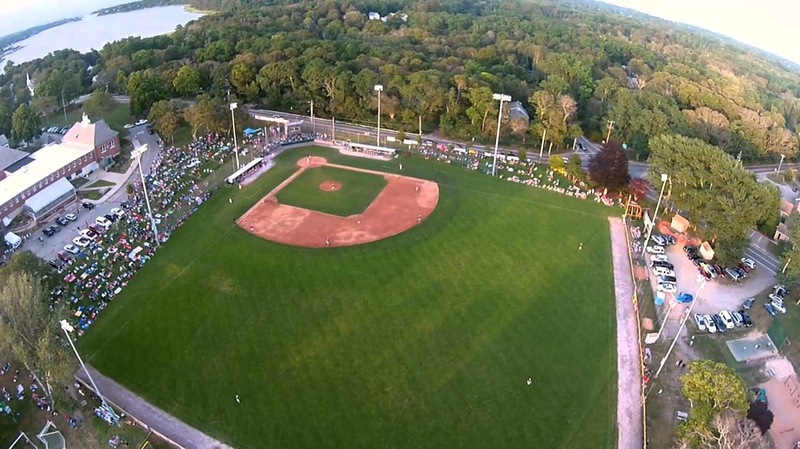 Eldredge can host some of the biggest crowds in the Cape League. 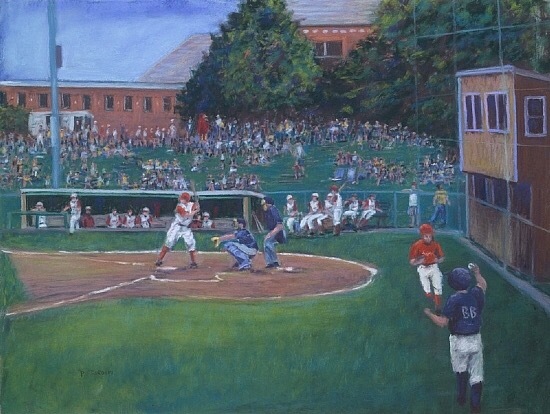 I was at the highest attended Cape League game to this point, a playoff game between Orleans and YD in 2015. Why can it host so many? Well there’s a ton of space around the fences. Plenty of open grass and room to sprawl out on a blanket and make it a picnic. 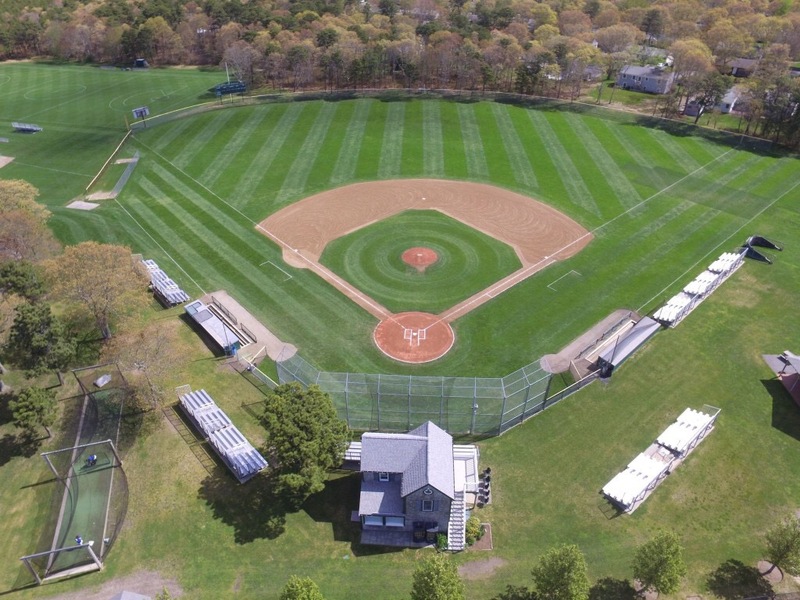 The most distinct feature of Eldredge is the hill overlooking the first baseline all the way from home plate to the foul pole. It’s common practice to bring chairs, blankets, and other stuff and mark off spots on the hill the morning or afternoon before a 7pm first pitch. It serves as excellent advertising before the game and a great place to watch from. You can see everything, you can sit in a comfy lawn chair or blanket, and enjoy one of the prettiest baseball sights you’ll ever experience. Similar points apply to the area behind the third baseline. It’s not as high a hill or as distinctive, but there’s just as good, if not better, a view there. It’s actually my favorite place to sit for a game here. There’s also room to sit in all parts of the outfield. So in terms of locations and spacing, there’s incredible variety and quality in every place. The only point I’m taking off is for a lack of variety in kinds of seating. There are four bleacher seat areas. One’s in close to deadaway center, one’s in right field and two are near home plate on the first base side. The issue with these is that most of these are kinda useless. The outfield ones are partly obstructed by the top of the outfield fences, so you can’t sit on the lower parts and see the game. And the ones near home plate are in front of each other, thus making the back one kind of an obstructed view. 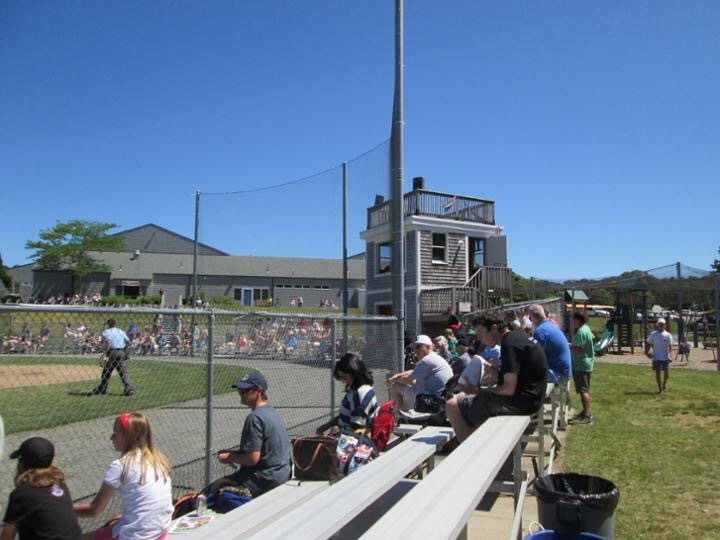 Yeah, an obstructed view behind home plate, that actually exists in a park without pillars. 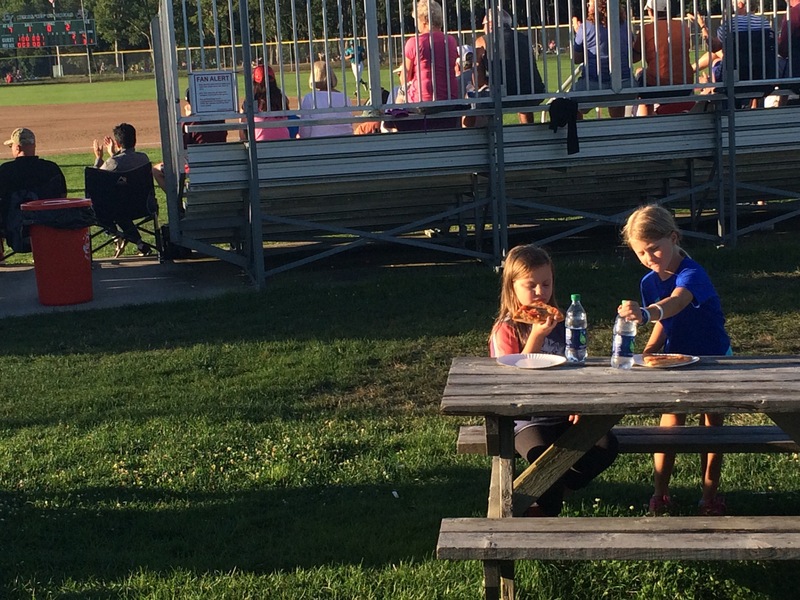 There are also some picnic tables in right field, and while these are pretty good, they feel like an afterthought. They’re just kinda there without more being available to do or see under the trees in right field. All this is to say that Brewster does a better job of seat variety. To get a great experience at Orleans, you have to bring a chair or blanket, or be ok with sitting on the grass. Here’s the thing though, if you’re cool with that, you’ll find better views, and a better air to enjoy the game, especially under the lights. Like Stony Brook, Eldredge’s food is managed by volunteers from the Nauset Public Schools. It is a ticket system for cooked goods and functions in a similarly efficient manner to Brewster. Things are pretty similar except in one major way, the location. Orleans’ food set up is behind the hill on first base, above the majority of the crowd. And it is very set back from the field. It feels remarkably separated from the action and takes you out if it while you wait and are distant from the game. It is the weakest part of the field and can be averted by not going there for food. Just go to some place in the business district. 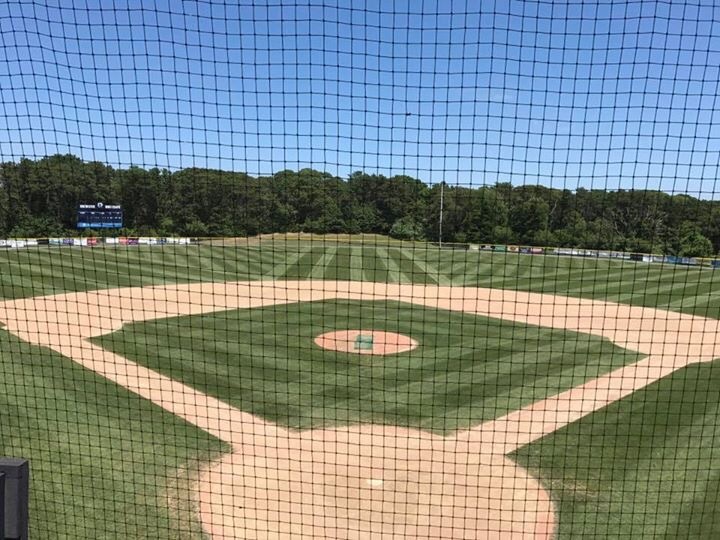 Without hesitation this is one of the prettiest baseball fields I’ve ever seen. 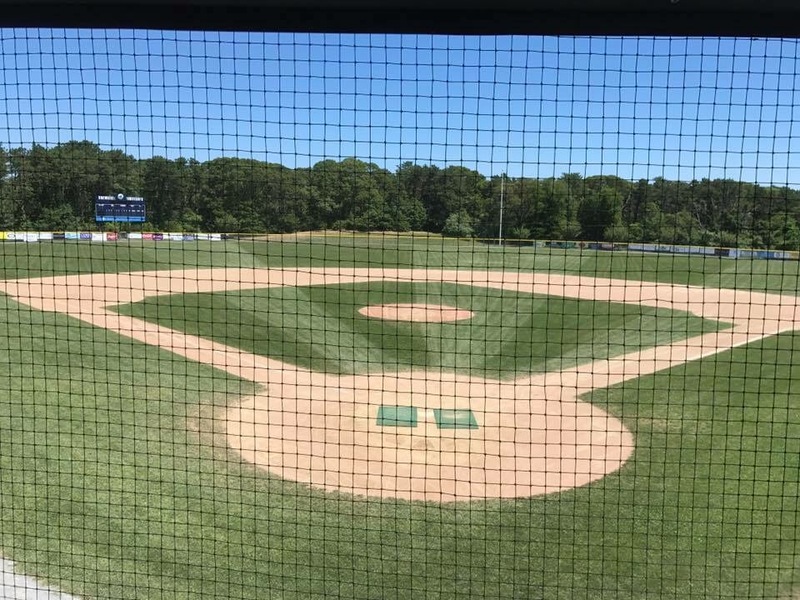 The field was renovated in the offseason and it looks gorgeous, green, and luscious. There’s greenery and trees around the field without feeling like you’re in a forest. 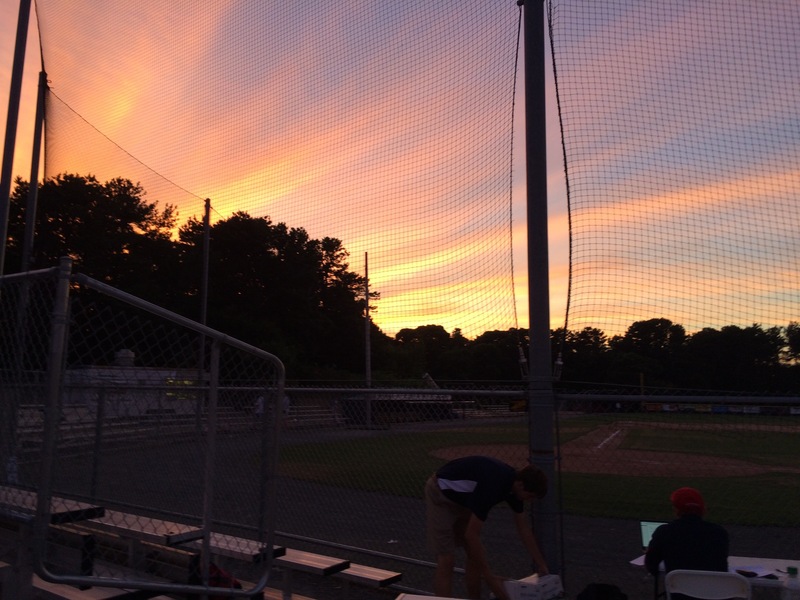 Games start at 7pm, so there’s normally a pretty sunset to welcome fans at the start of the game. 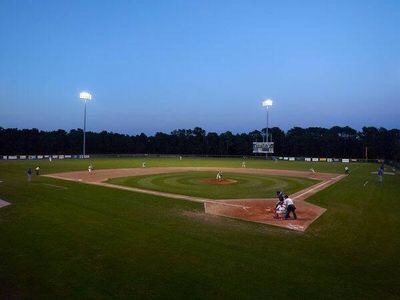 Playing under the lights is a lovely touch. It feels like big time baseball, and makes the experience feel like a scene from Field of Dreams. It’s also the most distinct field in the league, hosting the most unique set pieces. Rt. 28 gives the chance for foul balls to hit cars, the hill is a lovely touch, and there’s a band stand in right field that serves as the view for the Orleans bullpen. It’s a unique look. The outfield decoration isn’t as good as Brewster, with few patterns in the grass, but everything else about this park is so perfect that any complaint would be a useless nitpick. This park is beautiful. Again, this is one of the best experiences I’ve ever had at a baseball field. Every point from the prior category applies here. 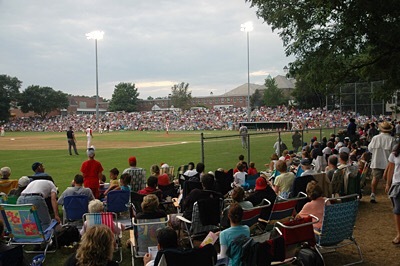 The chance to sit at a unique looking ballpark under the lights watching teams of excellent college players is a marvelous experience. 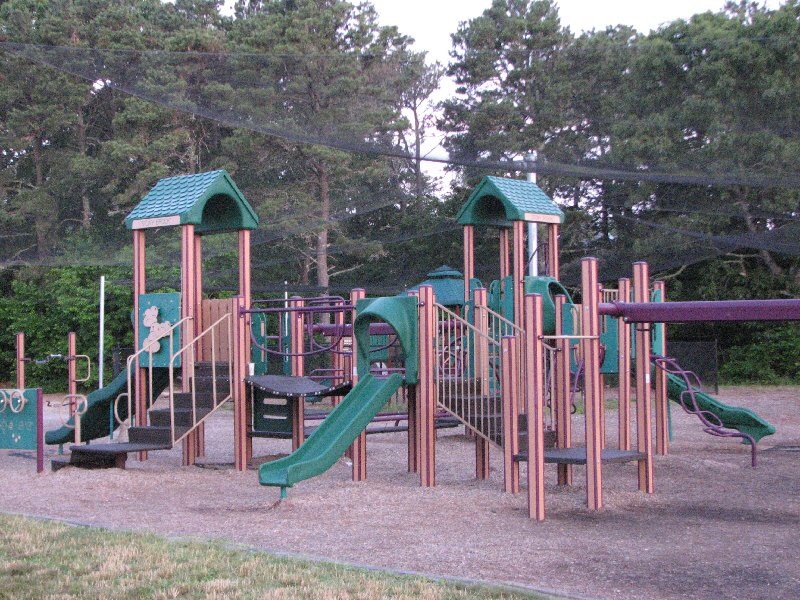 The kids can enjoy running on the flat grass between innings, playing on the playground in left center field, and siting with their parents and grandparents a the ballgame. The crowds are big, the chance to sit out on the grass and picnic is a lovely chance, and the air around the park is wonderful. Perfect marks again. 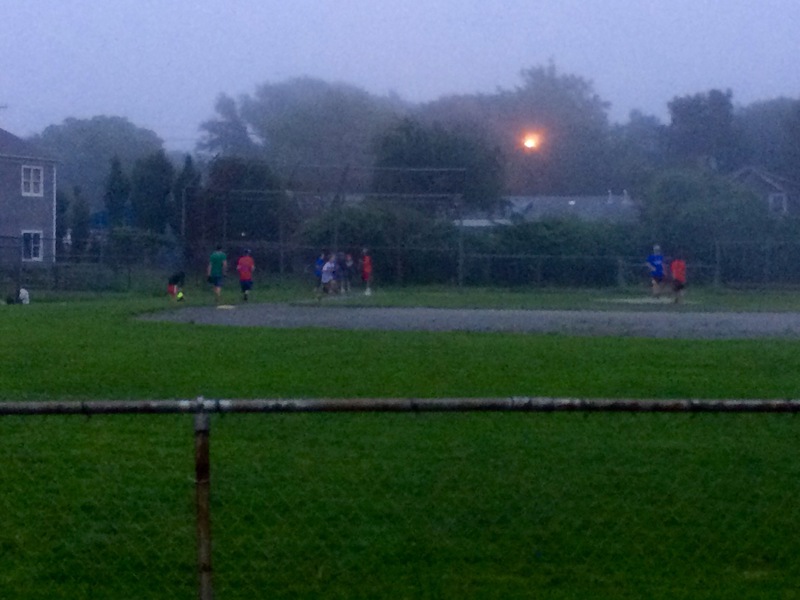 This is one of the best baseball experiences you can have. I am not exaggerating. The field is perfectly located, wonderfully set up, and absolutely beautiful to look at. It does require a little more work to get a great experience out of this than at Brewster. You pretty much have to bring a blanket or a chair to sit on the hill and get the best experience. But the best times at this field are among the best in the sport. 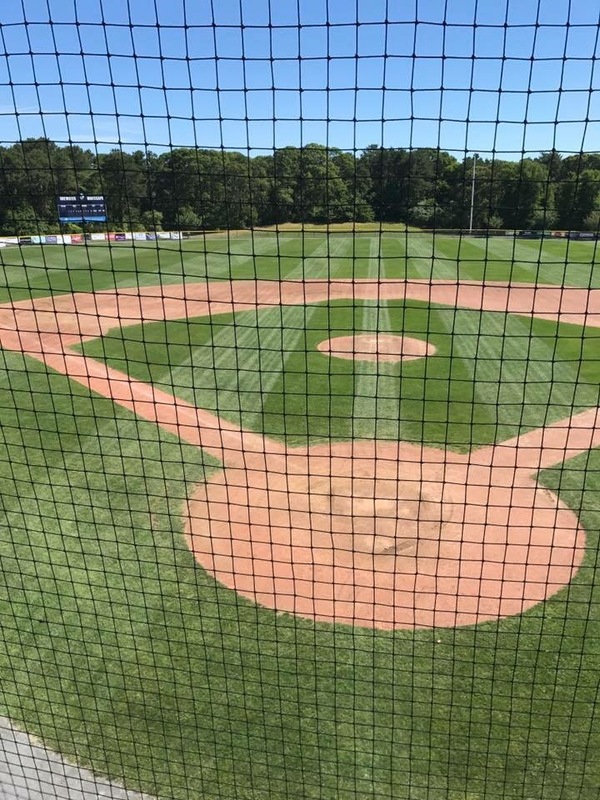 This is not just a required visit for the Cape League, this is a required trip for any baseball fan.